We buy gold! Yes, we know, so does everyone else. There are a few reasons you should give us a try. 1. We pay absolute top dollar for scrap. Broken earrings, coins, dental gold, worn out wedding rings and such. 2. Unlike most buyers of scrap, We give extra credit for useable diamonds, clasps, and ring shanks. Most places just pay scrap price and that is it. 3. It's quick, safe, and simple, all you need is a drivers license and a phone number. We weigh it, and make you an offer right on spot. No hard sell, you can take it or simply walk away and we'll still be friends. (We try to make sure we pay more than anyone in the area.) AND with our world class security system you can feel safe in our store. 4. All sales are confidential. 5. 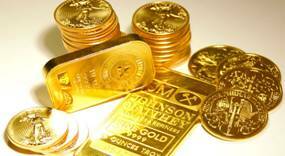 We also sell gold and silver bullion and coins. 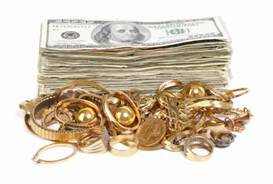 Ask to speak to one of our gold and silver specialists.